Pulau Tiga is located about 35 nautical miles southwest of Kota Kinabalu and is part of the Pulau Tiga Marine National Park. It is famous as the location of the USA Survivor TV series. There are actually three islands in the marine park, Pulau Tiga, Pulau Kalampunian Damit and Pulau Kalampunian Besar. Pulau Tiga has one resort on the island with a PADI dive centre. 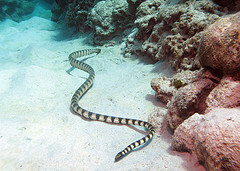 There are several good dive sites around the islands and marine life is abundant. Healthy fringing coral reefs are generally shallow with 10-20m visibility. All the usual reef fish are there including snapper, trevally, fusilier, soldierfish and surgeonfish. Bamboo sharks can be seen under coral ledges and stingrays can be seen in the sand. Pulau Kalampunian Damit is better known as “Snake Island” because it is a sea snake breeding ground so diving around here guarantees sightings of banded sea snakes.